Perhaps one of the most predominant influencers of mindfulness in the West and in medicine is Dr Jon Kabat-Zinn, the creator of the Mindfulness-Based Stress Reduction (MBSR) program that originated at the University of Massachusetts and is now taught worldwide. His original research, published in 1982, demonstrates the benefits of a mindfulness meditation program, and since that time, there have been copious published articles that show similar gains in different populations, including business leaders as it pertains to working with the self.1 However, Dr Kabat-Zinn is just one of many others who have brought the traditionally Eastern practice of mindfulness to the West from its original roots in Buddhist and Hindu cultures. Dr Kabat-Zinn defines mindfulness as “paying attention in a sustained particular way, on purpose, in the present moment and nonjudgmentally.”1 By this definition, mindfulness is simply a way of being aware of what is occurring, and then accepting the moment-by-moment experience without judgment. In the most simplistic terms, mindfulness asks us, “What are you aware of?” and “Can you be with it for this moment?” Building on this definition from the traditional roots of mindfulness, one can also include an active, appropriate response to what is occurring in the present situation. Thus mindfulness can, and often does, involve an open, receptive, and active approach to life. Often when people discuss “mindfulness,” they immediately think of meditating while sitting on some cushion in a faraway land. However, formal meditation is only one way in which the practice of mindfulness is expressed. When the Buddha taught the practices of mindfulness, meditation was a core practice in gaining the ability to steady the attention so we could pay attention, but it was not the only practice. We can apply the overall approaches of mindfulness to any areas of our lives including when treating a patient, completing our daily documentation, and also when eating, exercising, and talking with one another. Contemplation of the mental states: Recognizing how our mental state creates our relation to experience. In other words, if you imagine that 10,000 fierce tigers surround you, you can also become aware that the first thing you can do is to stop imagining them. Commit to the practice. One of the critical parts of gaining anything out of something you want to do is to first commit to practicing the new skill regularly. For example, you may want to learn how to swim without ever getting into the pool. You can read about it all you like, but you will never really learn until you get in the water and begin to practice. Start slowly by committing to 5–10 minutes of practice a day. Choose a comfortable environment. It helps when first learning the practice to find a relatively quiet place where there are few distractions. Sit comfortably in an upright, supported posture as this makes noticing the breath easier and also allows the body to relax. Once you’ve established a reliable location and position for your practice to begin, you may choose to keep the eyes partially opened or completely closed. Either is a valuable approach. One benefit of closing the eyes is that you may be less distracted by things coming into your direct vision; however, some people report that they also fall asleep more easily. You may like to try both options and see what works best for you. Place your awareness on the breath. Using the breath as an anchor allows us to develop the ability to notice when we are no longer “present.” While you can use almost anything as an anchor for your attention as you practice, the breath is the easiest, most reliable anchor to start appreciating. As you gain skill, you can use sound, body sensations, and even your heartbeat as an alternative anchor. 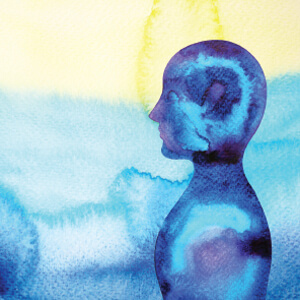 Recall the four foundations of mindfulness mentioned previously. You will want to get familiar with where you feel the inhale and exhale most reliably in your body. Some people notice the air coming in and out of their nostrils, and others are aware of the rise and fall of their chest. Again, what matters is that you can find your breath wherever it feels easy for you to do so in your body. Then you simply pay attention to the breath. Well, sort of. Here are some other things that you may notice as you begin your practice. You may feel that you want to jump up and run out of the room since sitting still is utterly antithetical to anything you have ever understood about living before (this was my experience when I first practiced). You may notice that you keep trying to focus on your breath, but instead you are thinking about your grocery list, your email inbox, and why the person at the coffee shop gave you that odd look yesterday. You may also notice all of your judgments about how poorly you are doing, and that you, yet again, are messing this all up. Or you may congratulate yourself for noticing your breath for the past three times when all of a sudden you realize you haven’t been aware of your breath for the past five minutes as you were congratulating yourself. And so it is with our early stages of meditation practice. All that is necessary during these moments of realization is to merely and gently return to the breath. The benefit lives within the noticing, being able to let go, and then return. We begin again. For those who may like a little extra support, guided meditations can be very helpful when beginning a meditation practice as a tool to assist us in steadying the mind and body. There are many applications that can be used. Before starting a guided meditation, ensure your handheld device has all alerts disabled to avoid distraction. Listed are some of my favorite applications and technologies for guided meditation. Over time, it is good to also practice in silence. Insight Timer: This app is entirely free and includes over 7,500 different types of meditations with the ability to customize your timers with varying lengths of time and chimes. The guided meditations are created by some of the world’s most reputable mindfulness meditation teachers, and you can easily find meditations ranging from beginner to advanced. The app also includes other forms of mindfulness practices like yoga. In addition, Insight Timer offers an opportunity to connect with a community of others interested in meditation based on your location. Headspace: Andy Puddicombe, the developer of this application, has extensive experience in mindfulness meditation. The first 10 meditation sessions are free, and then afterward you may continue with a paid subscription. He provides further insight via great animations to understand meditation as you are learning, and categorizes the meditations into groups that support relationships and better health. There are also meditations that include visualizations, which are another way to practice and cultivate positive feeling. Buddhify: I will admit that the original approach of this app was not necessarily the approach I employed in meditation as they described it as “meditation on the go.” I did give this app a good use, however, and it is quite useful in different ways. First of all, you pay one total fee and there is no subscription. You can add various meditations to a colorful “wheel” and build your wheel to include guided meditations for moments such as traveling or sleeping. Beginner meditations abound, and many other categories are available such as a section for children. 1 Ludwig S, Kabat-Zinn J. Mindfulness in medicine. JAMA 2008;300:1350-1352. 2 Hofmann SG, Sawyer AT, Witt AA, et al. The effect of mindfulness-based therapy on anxiety and depression: a meta-analytic review. J Consult Clin Psychol 2010;78:169-183. 3 Smith SA. Mindfulness-based stress reduction: an intervention to enhance the effectiveness of nurses’ coping with work-related stress. Int J Nurs Knowl 2014;25(2);119-130. Daphne R. Scott is chief culture officer of Confluent Health, LLC. She can be reached at daphne@daphne-scott.com.